...but the doctors said the hit to my chest was so hard I was like a police officer who'd been shot while wearing a bulletproof vest. It was Monday at the Pier. Low tide, 30+ knot winds...an epic session was guaranteed for all. Except me. On my very first run (sailing a 4.0) I was overpowered within ten seconds of leaving the beach. I thought "let me go out a bit anyway...I'll rig down in five minutes." I got twenty more good seconds in before I stuck the leeward rail and got slammed hard, chest into the boom with all my weight. It hurt. After a minute I waterstarted, and immediately knew I had to get off of the water and rest. Back on the beach breathing was painful and I felt stunned, and when I didn't feel any better after 20 minutes I grabbed my rig and began walking it back to my van. Jeff took one look at me and said "let me take that for you." I sat around in a daze for an hour, watching everyone (Jeff, Jon F, John H, Scott, Jason, Fisherman, the Wolf etc) tear it up. It became clear that I wasn't going to be getting back on the water that day, so I came home. When I woke up the next day and felt no better it was time to call the doctor. So when can I sail again? "Let the pain be your guide" said the doctor. Breathing still hurts, so we wait. The freestyle you can see from the beach at Bonaire's Lac Bay is astonishing. Not only can you watch Kiri Thode, Tonky, Taty, and Choco Frans, but also the extraordinary nonplaning specialist Caesar Finies. On a recent trip to Bonaire I taped several of Caesar's practice sessions. He told me that the wind (which was averaging 16-18 knots) was a bit strong for his style of sail handling and that he would not have his best control, but that I was welcome to shoot anyway. Check out what Caesar can do with a 5.0, as his practice session lights up the beach in front of Jibe City. 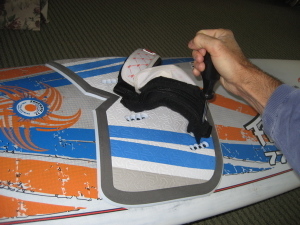 Adjust footstraps on windsurfing boards. In the house. There are several new Fanatics on the beach these days, and we owners have been noticing that the footstraps are a bit narrow for booty sailing. Both Jon Ford and Jason have suggested hacking the situation by moving the front screw of the front straps forward one hole (where it would normally be if the entire footstrap was moved forward one increment) and the back screw of the rear strap back one hole. I have now done this, and hope to judge the results tomorrow morning. I've takent to referring to the board as "Seventy Seven" which is kind of short for 77th Heaven, a name suggested by Litoralis, who comes to us from sailboat land (sailboat water?) Litoralis chimed in back when I was searching for a name for this brilliant little board. When the Pier started going off a few weeks ago, the old tried and true launch of Meschutt (formerly the NW favorite) was tossed out like bad milk. Nobody wanted to go to Meschutt...nobody wanted to talk Meschutt. It was all "Pier Pier Pier..."
I arrived late...around noon, but my timing was uncharacteristically good. Everyone (Jason John V Jonathan Frank Scott Jeff) was coming in to rig down. Scott said he was lit on a 4.7, so I put up a 4.5, grabbed my 77 and hit the water. I'd never been at Meschutt during an extreme low tide before. For 50 yards the water was calf deep, with tiny broken waves coming straight in through the shallows. Once the water got knee deep though, you could shoot off to the northeast and hit the source of the previously mentioned little waves: perfectly formed two-foot breakers, lined up one after another. If you caught them before they broke you could have lots of fun getting decent air off of such small ramps. Further outside it got bigger (and deeper) with the largest swell about four feet high. During a break on the beach The Wolf and I had a brief chat about the joys of 70 liter boards. We both have Fanatics...mine a 77 liter FreeWave, his a 76 liter AllWave. John had a big grin on his face when he described sailing his little board on the water: "It's a piece of candy!"